Our managing director, Richard, is a man who doesn’t really do sleep. He wakes up at the time of day that is too late to call nighttime and far too early to class as the morning, and is almost certainly fuelled entirely by caffeine. Aside from there being two Richards, coffee pumping through his veins is the only rational explanation for this 24/7 existence. If anybody could use a Handpresso Auto, Richard could. This in-car espresso machine is nothing new. Indeed, Handpresso launched in 2008, offering portable coffee to people on the move. 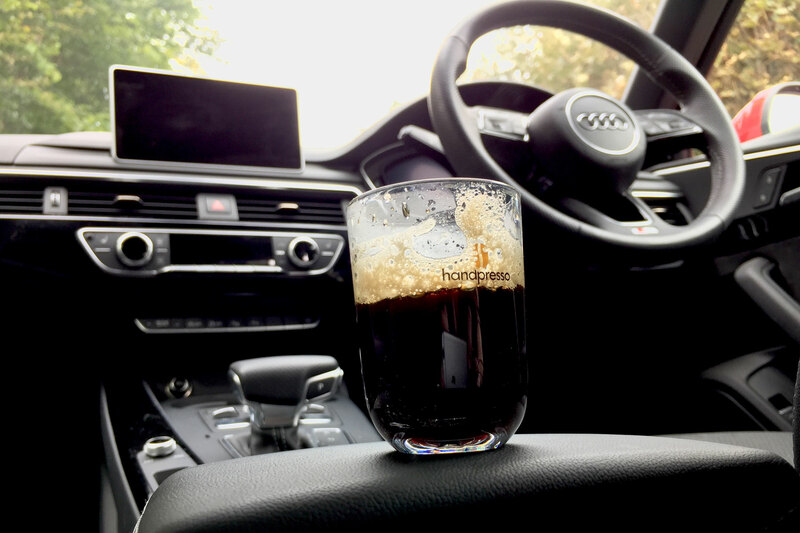 Famously, Handpresso teamed up with Fiat to offer a Lavazza coffee machine in the 500L, while Audi, Volkswagen, Skoda and Suzuki have all signed up for a shot of caffeine. You can understand the appeal. For a nation of tea drinkers, we consume an awful lot of coffee, with recent figures suggesting more than 8m paper cups are handed out by coffee shops, every day. But why go to a shop when you don’t even need to leave the car? Handpresso claims its latest portable barista has been revamped inside and out, but the real news is its ability to use ground espresso, as well as ESE pods (that’s Easy Serving Espresso, in case you were wondering). At £133, it’s not exactly something you’d buy on impulse, but if you spend a lot of time on the move, not to mention a lot of cash in coffee shops, the maths start to add up. Say you drink five takeaway espressos a week; at £1.60 a cup, that’s £8 a week or £416 a year – enough for a Handpresso and a good supply of pods. But what good is a business case if the coffee experience doesn’t stack up? You’ll have to forgive the use of the word ‘experience’, but the fact is, we’re happy to spend a small fortune in coffee shops because of the full package. A good drink, polite service and the buzz of the coffee shop are central to the appeal. OK, so sat in motorway services car park preparing an espresso isn’t going to provide the ambience of a high street coffee shop, but if the ads are to be believed, drinking a good espresso will turn you into George Clooney. Sadly, no matter how sharp your suit, a Handpresso isn’t going to result in attractive ladies siding up to you, keen for a chat. It’ll just be you, listening to Jeremy Vine, and catching up on your work emails. Sorry to shatter any illusions. The machine itself is reassuringly weighty and, to be honest, a little daunting. The combination of 16 bar-pressure, water heated to 95ºC and the responsibility associated with creating the perfect espresso could be all-too much for some people. It doesn’t help that the instruction manual runs to 88 pages, although thankfully only a small part of this is English. Because the world loves a good coffee, right? 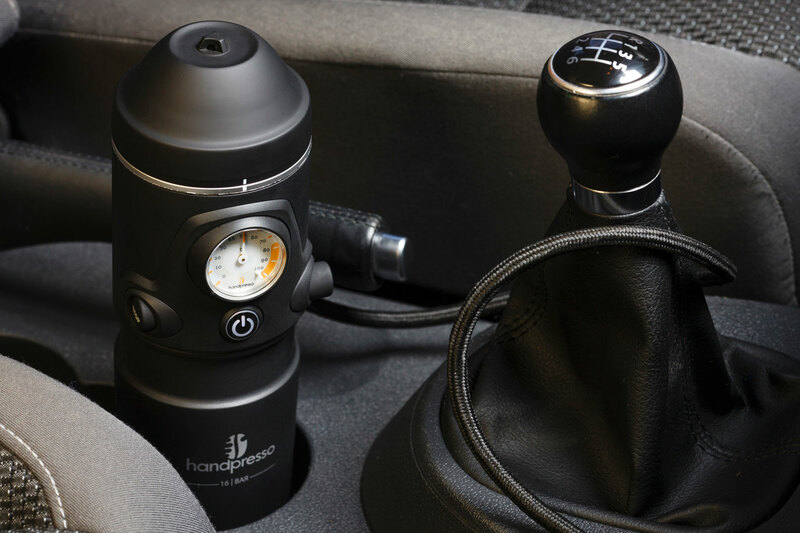 The Handpresso Auto connects to a 12-volt cigarette lighter and sits neatly in a car’s cupholder. We say neatly, although there’s certainly some wiggle room in the cupholders you’ll find in the Audi A4. Not that this matters, because you wouldn’t necessarily have it in place while on the move. First instruction: “make sure that the vehicle is stationary, the parking brake engaged and the engine turned on”. We hope people wouldn’t be daft enough to make an espresso on the move, but given the number of drivers who are all too willing to use a mobile at the wheel, you never can tell. Fill the reservoir with approximately 50ml of water – there’s a neat level indicator on the top to avoid overfilling – and, assuming you’re opting for the pod method and not ground coffee – stick a pod in the pod holder. Place the portafilter on the top, press the ‘on’ button and the machine starts to heat up. As you can hear and see from this short video, it’s not the quietest machine on the planet, but it only lasts for a minute or so. That said, it might be an idea to keep your windows and doors shut when the Handpresso is doing its thing – people might start to ask questions. Come to think of it, be careful if you’re preparing coffee in a layby during the night. Explaining to a police officer that you stopped off for a quick Handpresso might lead to problems. Two minutes later, you’ll hear three beeps, at which point the espresso is ready. Flip the machine over, place the supplied cup underneath, press the right button and – hey presto – your injection of caffeine is served. Eat your heart out, George Clooney. Admittedly, our first attempt wasn’t entirely successful – you’d be asking for your £1.60 back if we presented you with this espresso – but it tasted as good as any shop-bought coffee we have experienced. It’s also better than a Thermos flask filled with simmering instant coffee. If we are being hypercritical, the espresso isn’t anywhere near hot enough. You won’t need to wait for it to cool down, which is fine if you’re in a hurry, but not so great if you’re looking for the perfect drink. Imagine the possibilities. You decide when you want to stop for an espresso – no more waiting for the coffee shop to open; no more queuing; plus a little extra cash left in the bank at the end of the month. You’ll also be putting a small dent in that paper coffee cup mountain. Is it worth £133? That depends on how much coffee you drink and how much time you spend on the move. At the time of writing, the price has been reduced to £119, which could make the decision a little easier. In our view, forking out extra for the hybrid model – with its ability to use ground coffee – is a no-brainer. It just makes the Handpresso that little bit more useful and won’t leave decaffeinated should you be down to your last ESE pod. A life-changer? More of a life-enhancer and one which could make your car easier to sell. Because everybody knows home buyers warm to the smell of fresh coffee when house hunting. A car interior smelling of espresso has got to be better than the whiff of wet dog or unwashed gym kit. There are hundreds of different ESE pods on the market, with prices varying depending on quality and brand. We found a pack of 150 Lavazza pods for £40, which works out at less than 27p per cup of espresso. Not bad, eh? Sure, the espresso could be hotter and if you want more than one cup, you’ll have to repeat the whole process. But these are small prices to pay for what is a genuinely good drink. We’ll be recommending one to our MD.